If you’ve ever bought an older home or lived in the same house for years, you know how awful an outdated bathroom can be. 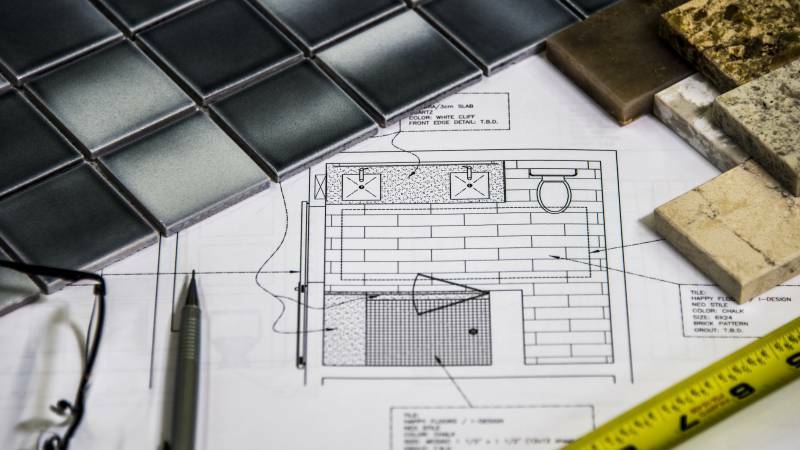 The idea of a complete renovation or simple update is a real mood-booster – until you start doing the math, that is. Remodeling your bathroom is expensive. According to Angie’s List, Americans spend an average of $9,600 for bathroom makeovers. However, with careful planning, you can save thousands of dollars on a brand-new bathroom. Here are easy ways to cut costs and save money when remodeling your bathroom. New floor tile, light fixtures, and hardware are pricey no matter where you shop, but you can find great deals at big-box retailers like Home Depot – if you know how to find the lowest prices. For example, at Home Depot, prices that end in .06 aren’t as low as they can be. A price ending in .06 means the item will go on sale in six weeks. If it ends in .03, the product will be discontinued in three weeks. And paint always goes on sale on holiday weekends. Additionally, every Home Depot employee is authorized to give a discount of up to $50 if there’s a good reason. If the sink fixture you’re eying on display are the last item of its kind in stock, for instance, ask the clerk to mark it down. If your large bathroom fixtures are still in good shape, you can save significantly by simply changing out the accessories rather than replacing your entire bathroom. Paint the walls a fresh new color. Get a new shower curtain and matching rug. Change out the towels and window coverings. You’d be surprised how many affordable vanity accessories you can find at retailers. Shop at dollar stores for jars, drawer organizers and candles. If you have bare wall space, hang industrial-chic shelves. Unlike bulky standing or wall cabinets, open shelving in a small bathroom creates the illusion of space. Use wire baskets to store pretty soaps, lotions or linens. Wicker baskets with lids are ideal for personal items. A small tin pail with a potted plant will add a homey touch. These small tweaks will go a long way to update your look. Another idea is to find a tile you like and post pictures of it on Craigslist. People may have leftovers to sell. Search eBay as well. Buy up all you can at fire-sale prices to redo your bathroom without spending full price. If you can’t afford to replace your cabinetry, fake it. Stains and wood dyes can transform the finish on tired-looking cabinets into deep, rich colors that look like you paid a fortune. You can achieve a “new” look without tearing a single cabinet down or paying for replacements. You can also dress up any bathroom with a framed mirror. They’re expensive, but here’s a fun fix if you have a builder-grade mirror: cut crown molding to size. Simply affix the “frame” of crown molding to the wall around the existing mirror. Surplus construction materials, such as plumbing fixtures, cabinets and vanity tops, are resold at a fraction of their original cost. Try reuse centers like the Habitat for Humanity ReStore. Since they only accept discards in excellent condition, you may even snag products that are still in the box. Reuse stores get new donations every day, so check back often. Along the same lines, save on granite or other countertop materials by asking to see remnants first. If your vanity isn’t too long, the granite company will probably have discounted remnants that are large enough. It’s tempting to rearrange a toilet or tub if doing so would give you more space, but try to resist making such big remodeling moves. If the existing pipes have to be reconfigured, you’re looking at around $5,000 for a “simple” switch. Finally, if you’re making significant changes, hire a local contractor. It may seem easy enough to watch a video tutorial and retile your shower, but you don’t need the stress. Do-it-yourself projects don’t save money if they have to be torn out and redone. An experienced professional can help you plan, stick to your budget and avoid costly errors. Contractors also have access to resources that you may not have thought of. They can locate parts and address any unforeseen electrical or plumbing problems that may arise. Hiring a contractor will save you countless headaches no matter the size or scope of your remodel. And you can easily find one in your area. Interested in hiring a contractor for your bathroom remodel? Start a search today.